One common statement about Pot Limit Omaha is that hand values run very close in Omaha (compared to Texas Hold’em), and in a sense that is true. In Texas Hold’em, a big pocket pair can be as much as a 7-1 favorite pre-flop. It is rare for one hand to be more than a 3-2 favorite over another before the flop in Omaha, and even a 2-1 favorite post-flop is uncommon. It is understanding those small edges, and how to exploit them, that sets the best players apart from the pack, but more importantly, it is finding situations where your opponent can not improve or is drawing to a weak draw that the good players really earn their wings. An observer approaching a Pot Limit Omaha table from across the room would be hard pressed to differentiate it from all the Hold’em tables surrounding it. Nine or ten players, a dealer button, two blinds, five cards on the board dealt as flop, turn and river, except for the four hole cards held by each player, it appears quite similar to its Texas Hold’em cousin. Learning the differences in play between the two games is very important, though. Four hole cards does not mean you have twice the chance of winning! PLO adjustment number one: the two-card rule. This is the number one change that new Omaha players must get used to. You must use exactly two of your four hole cards, along with exactly three board cards, to make your best five-card poker hand. Gone are the days of the four-flush magically filling on the river and somebody sucking out with a weak flush card of that suit. To make a flush, you must have two (or more) of that suit in your hand, and three (or more) of that suit on the board. The two-card rule is easy to forget. When your humble author was completely new to Pot Limit Omaha, I lost a huge pot with AK44 when the flop came A4x. Woohoo! A44 in my hand plus A4 on the board equals full house! Ship it, dealer! I knew the two-card rule, but I forgot it in the heat of battle, and paid for my mistake. Of course experienced players will tell you that AK44 isn’t a very good starting hand anyway, but to Hold’em players, AK and 44 are decent hands, so AK44 must be good, right? A friend tells the story of a live Pot Limit Omaha tournament, where he held AAKJ, double suited, early in the tournament. This is one of the top few hands you can be dealt in PLO. Several players limped, guy in the cutoff seat raises pot, and it’s on my friend on the button. Since the pot is already huge, and his hand is premium, my friend elects to re-raise pot to try to isolate on this opponent. The guy proceeds to re-raise pot again (! ), putting him nearly all in. My friend went ahead and put him all in, since they were almost there anyway. They turned up their cards for the dealer, and the villain showed QQQQ. Four queens look beautiful all in a row like that, but against AAKJ, the queens are drawing completely dead. The guy with the queens had no chance of winning. The only hand he can make is QQ plus the three best board cards. Against my friend’s AA, he was behind before he started. My friend reports that it took the tournament director ten minutes to get him calmed down after they told him that he did not have quad queens. 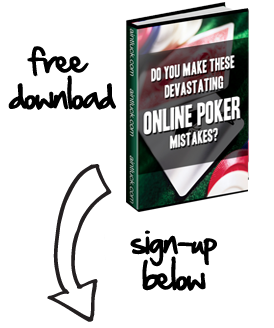 These two examples are extreme, but intended to keep you from making the mistakes lots of new Pot Limit Omaha players make more than once (doing it once is a learning experience. More than once is a bad habit.) Unfortunately for the guy at the tournament, his learning experience cost him $550. If you like this article, you will enjoy our article on the differences between Pot Limit Omaha and Texas Hold’em starting hand values.